ShoutBloger: Tablet computers with Android operating system is scattered on the market. Fujitsu also try to be different with Arrows tab F-01D android, a tablet that is designed tough enough to face less favorable conditions. 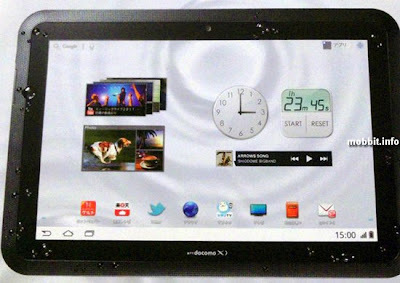 Tablet with 10 inch landscape display is declared waterproof and dustproof. Presumably, a tablet with this kind of resistance is still rare on the market. The Arrows tab F-01D Fujitsu's specifications are quite promising. He is among others equipped with dual-core processor 1 GHz TI OMAP4430, 1280x800 resolution screen, 1GB RAM, 16GB storage, or front and rear camera. As quoted from Liliputing on Tuesday August 30, 2011, a tablet that uses Android operating system Honeycomb also has connectivity options 4G LTE (Long Term Evolution). Even that is quite unique, Arrows Tab F-01D equipped with a TV tuner. Unfortunately, this tablet seems to just be circulating in Japan alone. Working closely with operators NTT DoCoMo, the Arrows tab F-01D android will go on sale early September.